Martins. Courtesy of Mario Ishikawa and Galeria Jaqueline Martins. Curated by Fernando Oliva and Tobi Maier, the exhibition conceives mail art as a global movement among artists from the centers and margins of the art system, from the late 1960s to the present. For many years the practice of using the post office services or fax machines as a strategy for creating and sharing graphic arts and other artistic projects has been at the root of mail art; the advent of information technology has shifted parameters towards the digital realm. Yet, ideas that were prevalent from the start of mail art have remained significant in artistic practice: networking, access to information, free movement, distribution, participation, collaborative work procedures and sharing are at the core of the conceptual framework for this exhibition. 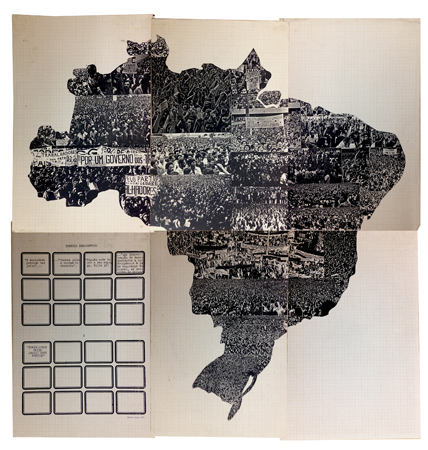 In Brazil, mail art matured during the dictatorship (1964–1985). For many artists living and working in the country during this time, sending art work via mail was the only way to personally connect with peers and other artists internationally. Within a political context filled with tension, mail art also played a denunciatory role.